Hey Japan, There's A New Playstation 3 Out Today! Let's Get Queueing For Shiny New Playstation 3s. 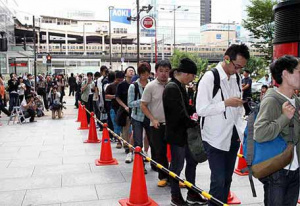 As proven by this set of images straight from the streets of Japan, where eager gamers are queueing to pick up their PS3 Slim. The Playstation 3 has sold abysmally for the past three weeks in Japan due to stock shortages and other issues. It's looking like that's not going to be a problem this week. Expect Sony to post impressive figures worldwide over the coming months.